Gold is a fashion and fascinating to us. We are obsessed with gold since generations. Gold makes and mars our most intimate relationships too. The god price has risen sharply in the decade up to mid-2011. Its popularity has risen too concurrently. That is difficult to understand, explain and rationalize. Our hunger, thirst and quest for gold beat logic. 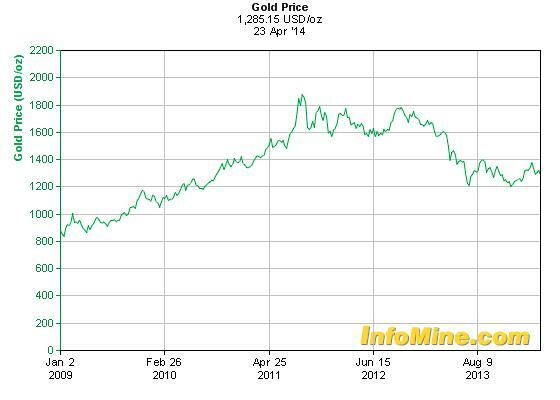 The above chart shows gold price trend since 2009 till date in US dollars per troy ounce. The rate more than doubled within two years. Amid expectations of it crossing 2000, and talk of even touching 8000, a fall is in the offing. 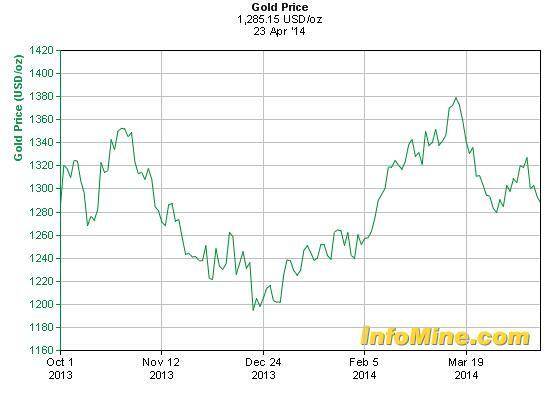 As I write on 6th May 2014, the real-time international gold rate is $1307. The Ukrainian War like crisis is causing it to fluctuate. In the summer of 1991, then Indian government decided to pawn 67 tons of gold to tide over a balance of payments crisis. Faced with dwindling foreign exchange reserves and a likely sovereign debt repayment default, RBI hawked 47 tons of gold to the Bank of England and 20 tons of gold to the Union Bank of Switzerland to raise $ 600 million. This gold trauma was national shame for public and our political leaders who thereafter distanced themselves from socialistic ideologies and set the ball rolling for economic liberalization. Possibly to erase that humiliation, in October 2009, Reserve bank of India bought 200 tons of gold from World Bank at an average rate of US$1045 at total cost of US$ 6.7 billion. That action reaffirmed that gold is an emotional issue with us. It is feelings and feelings; not clear-headed cold reason. That purchase put India at Number 10 among the list of top-10 sovereign gold-holders in the world owning 558 tons. Does Gold have an intrinsic value? The World Gold Council (WGC) estimates that a mere 174,100 tons have been mined in recorded history, equivalent to a cube measuring 21 meters per side. Therefore the entire gold mined so far is 5,597,444,977.598 troy ounces. At USD1307 a troy ounce, it would fetch 7.316 trillion dollars. Compare this to GDP of USA, the estimate of which is between 16-18 trillion dollars. If the entire world gold inventory is sold off, it would not feed global population for even one year! Then why do we keep buying gold and pass it on for generations? The central tenet of value investing is that one should never invest in an asset without estimating its value. For example, if an acre of farm land is purchased, crops can be raised on it, yielding recurring income season after season, year after year perennially. It is a cash flow yielding asset. If money is held in bank deposits, government bonds, company shares and given out on secured loans, income is earned in interest, dividend and bonuses. Capital is therefore cash flow yielding asset. Gold does not generate cash flow; instead, it costs money to safeguard it from theft, wear and tear as well as loss in purity. Therefore, gold would be ruled out as an investment for a fundamentals-based investor. - A Common Sense Guide to the Economy, he writes: a dollar invested in a treasury bond in 1801 would be worth nearly a thousand dollars by 1998, a dollar invested in stocks that same year would be worth more than half a million dollars. All this is in real terms, taking inflation into account. 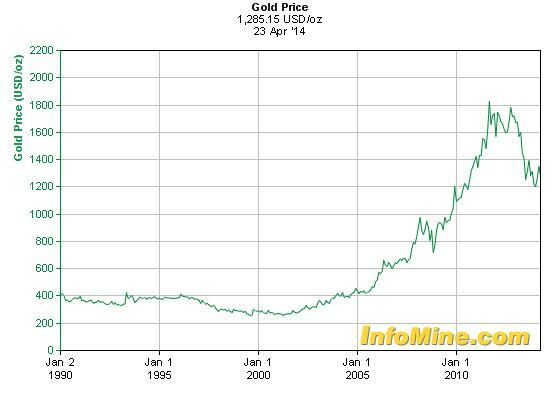 Meanwhile a dollar invested in gold in 1801 would by 1998 be worth just 78 cents. Warren Buffett has repeatedly argued against investing in gold because its true value simply cannot be estimated. According to him, the inflation adjusted average price since 1801 should be only USD 630. At USD1307, we are paying more than twice for the yellow metal. This obviously is due to demand-supply gap with us wanting to buy and horde gold more than new gold is mined or old gold is recycled for sale. In the above chart showing 24 years gold price trend, the rate was stable around $400 till 1996, and even dipped below $300. I am sure Modi and BJP did not research tis data. Otherwise, they would have taken credit for bringing down world gold prices by their policies! And most importantly, blamed Man Mohan Singh and his UPA-II government scams for the Bull Run when rate peaked above $1920!! Sonia Gandhi and her family would have been blamed for stealing all gold from the market and hiding it in Italy or Switzerland!!! Ha ha ha…. What if you had invested your money in Indian stocks instead of buying gold jewellery for your better half? One troy ounce of gold was trading at $282 on Jan 3rd, 2000. On this day, BSE Sensex-30 closed at 5375. Gold moved to a low of 260 in July 2001 and recovered to 384 by May 2004. 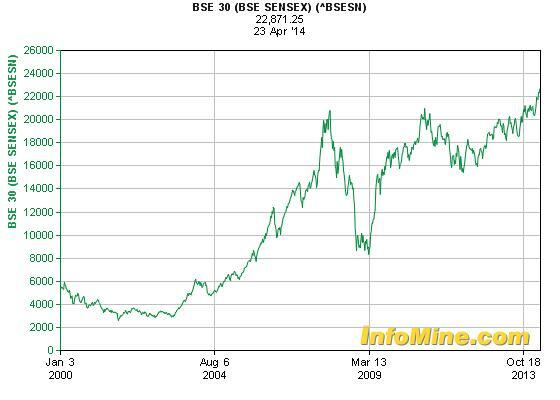 In the same period, BSE Sensex-30 saw a low of 2595 in September 2001 and recovered to close May-2004 at 5646. The gold during 1998-2004 averaged $330. BSE Sensex-30 averaged 3800 during the same period. Therefore, if you bought gold during NDA rule at average price of $330, at $1307 today, the gold is worth four times. If you had bought BSE Sensex-30 at average of 3800, the stocks are worth six times as today BSE Sensex-30 closed at 22,508. Within a time span of twelve years, your investments in stock would grow in value by 50% more than value of gold. Further, gold would not give an annual income. But stocks have given dividends year after year. If stocks have outperformed gold in India during the most derided decade long UPA rule with people perceiving our economic progress as unsatisfactory, would gold be a worthy asset in better times? A new government expected to take office within a week. Expectations are raised sky high about exponential economic development in coming five years. If you dare, please tell your wife: gold does not have fundamental value. Give me all your gold, let me sell and invest the proceeds in stock market! 1. World gold production from mines averaged 2,617 tons annually between 2003 and 2012. Additional 1020 tons of recycled gold was available annually, making the total supply 2637 tons. More than half of mined production came from six countries: China (13%), Australia (10%), USA (9%), Russia (7%), South Africa (7%) and Peru (6%). 2. The cost of mined production hovered in the range of $900-$1200. If the price were to fall below production cost, smaller mines will go out of business. In other words, the price of gold is unlikely to crash, but can correct to $900-1000 level. Unless, of course, investment in gold suddenly evaporates and recycled gold satisfies new jewellery demand. 3. 50% supplied gold goes into jewellery. 35% is investment in gold biscuits, bars and coins. Central banks hold only 4% as sovereign reserves. 4. China and India together represent 54% of global consumer demand. India imported 975 tons while China imported 1066 tons. The imports to in addition to the domestic mined production and substantial recycled gold supplies. 5. For India, gold is second biggest import bill after crude oil. In FY 2012-13, the gold import bill exceeded $50 Billion. Total current account deficit (CAD) was $88Bn. 6. The worsening CAD since 2010 onwards due to our increased appetite for owning gold is major cause for the crash of Rupee against the dollar. Rupee fell from average of 42 to the dollar in 2003 to 62 in 2013. 7. The explanation that gold is hedge against inflation is not borne out of logic as I explained above. It is a cultural and emotive issue only. There are plenty of avenues for better hedging than gold, but the yellow metal displays its fatal attraction. 8. In India, 75% of gold is used in jewellery manufacture. 9. Gold enjoyed twelve ears of Bull Run. It is over now. The Dollar was predicted to die. The Euro was predicted to vanish too. The Cheap money printing in USA begun in end 2004, known as Quantitative Easing (QE), and imitated by China, India, Russia and many others is being scaled down. The global currencies are stringer and there is no going back to gold standard. 10. The Economic Growth is China is slowing down. The double digit GDP growth is over. It is 7.7. % for 2013. India has slowed down too, to 4.9% in 2013. 11. This gupshup on gold is packed with history, data and logic. But, you are forewarned that you alone are responsible for any consequences arising out of your acts and or attempts to sell off your wife’s gold jewellery. The owner disowns any claims and responsibility. The Yettinahole Project: What the governments and politicians are hiding? Good analysis and related facts. Most politicians claim credit for the things which they have no idea! There are enough fools to support them. Love for gold among Asian women (and at times men are not far behind) is always at high level and the greed for yellow metal has often destroyed peace in household and substantial dowry crimes in the past! Many believe in pleasing God with gold for favors! I think our young and educated mass has less affinity for gold and ornaments. They look more for designer attires. Fortunately west and Europe (women) culture not too bother about gold and showoff on yellow sheen...otherwise price of gold would have been many times higher. End of the day, gold is an asset can be liquidated easily for urgent needs rather than property and other material wealth. Gold to us Indians is that ultimate love object not only does it adorn our bodies, it also acts as a good investment dear Philip! Your write-up about 3Gs and its investment value and detailed analysis are one of the best I have ever read about this precious metal. Gold is inherited. From mother to daughter to grand- daughter, gold has a tendency of getting passed down from generation to generation. So for Indians at least, gold will never lose its sheen. In fact the mentality is so possessive for gold that it will be sold as a last resort only and before that most of the other assets will be liquidated.